Pet dander is simply dead skin. Our cats and dogs are constantly shedding flakes of skin. This is called dander. Are they causing your sneeze? It is similar to dandruff, but not the same thing. A person with dandruff can see large, white pieces of skin flaking off their scalp. The main difference is that dander is very tiny. In fact, it is so small you can't see it with your eyes. You need a microscope to see it. For a long time many people believed pet allergies were caused by the hair, or fur, of pets. We know now that these allergies are caused by the dander of our pets. A person can be allergic to any pet that has fur. Pet dander allergies affect about 10% of the population. The most common pet to be allergic to is the cat. Many people are allergic to cats. To be specific people react to the presence of the cat protein Fel d1. This protein is found in glands under the skin of cats. It is also in their saliva and urine. When people come into contact with this protein, it causes a reaction. Cats are especially bad because of their grooming habits. Cats lick their fur regularly. This means cat dander contains even more of Fel d1. It causes more severe reactions in people. It is not just cat dander people can be allergic to. Dog dander is also has allergens. In a dog the protein is called Can d1. 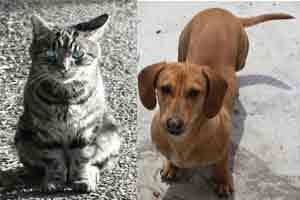 While people are allergic to dog dander, it is not as common as an allergy to cat dander. Rodents are the third group of pet that can cause an allergy. In recent years many people have been keeping rodents for pets. These guinea pigs, hamsters, and mice. These also produce a protein that can cause an allergic reaction. In rodents, however, people are more likely to react to the urine and not the dander. The symptoms of a pet allergy are the same symptoms we would see in any allergy. We have answered the questions "What is pet dander?" We learned that is causes allergies. Now how can we treat those allergies. The most common way to treat these is to use medicine to treat the symptoms. It is common to use an antihistamine. These can be purchased over the counter. For more severe reactions your doctor might prescribe a prescription medication. These could include steroids. As always, if you have allergies, consult your doctor before taking any medicines. You can also get Allergen Immunotherapy This is commonly called allergy shots. Allergy shots will help you body not to react as strongly to the cat allergens. Your symptoms will be less severe. We answered the question "What is pet dander?" Now let's look at "How do we control it?" It is very small. Most dander measures 12 - 100 microns. Some can be as small as 2.5 microns. At this size, there is no way you can see it with just your eyes. It can stay in the air for hours because it is so lightweight. It is also very sticky. It will stick to carpets, clothing, and furniture. It can remain there even after you've cleaned. It can also be stirred back into the air again by the daily traffic in your house. In order to keep dander from causing problems, you need to remove it from the environment. The best way to do this is to use an air purifier. Without an air purifier, dander will settle to the floor or furniture. As people move around in you house they will disturb the dander. This is make the dander airborne and easy for you to inhale. An air purifier will remove the dander from the air. It will be gone and you no longer have to worry about breathing it in. You want to be sure that you choose an air purifier with a HEPA filter. HEPA filters can remove particles larger than 0.3 microns. These filters are capable of removing all the pet dander from the air. In addition to reading our article "What is pet dander," please read our article about dander control. It provides ideas to control dander if you want to continue to live with your pet. We have reviewed many air purifiers here on this site. We hope that you will use these reviews to help you choose the best air purifier. If pet allergies are you main concern, read our review of the Austin Air Pet Machine. We highly recommend this air purifier. Leave What is Pet Dander Page and Return to Air Purifiers, Asthma, and Allergy Page. Leave What is Pet Dander Page and Return to All About Air Purifiers Home Page.